When embarking on the journey of learning karate, you must realize how much you learn will depend upon how much you want to learn. You have to be willing to invest time and effort to accomplish your goals. There is no hidden secret which will make you an instant, super Karate Person. Karate is a fighting art that employs almost all parts of the body in offensive and defensive moves. Karate techniques consist of many individual moves that are practiced as individual techniques and also in combinations. You will learn basic drills for stances, kicking, punching, striking, blocking, combinations of techniques in formal patterns, prearranged attacks and counterattacks, stepping and shifting, etc. Some of the moves are directly applicable to free fighting (Kumite) while others develop basic speed and coordination. One must train and drill extensively until each technique becomes reflexive and speed, power, accuracy, and balance are attained. You must have enough patience to take one step at a time in progressing toward perfection of your techniques as well as your character. Karate is known as the ultimate in self-defense. There are many benefits that go along with self-defense. They are: physical attainments, agility, balance, speed, power, endurance, patience, respect for others, humility, self-confidence, release of psychological and physiological tension, knowledge of the history of Karate and the Orient, knowledge of Zen philosophy, sportsmanship, opportunities to make new friends, and above all an opportunity to learn Karate as an art. As Karate students you will realize that we teach Karate techniques (fighting skills) for use only in emergency situations. It is like learning first aid – one does not hope to use this knowledge of first aid constantly. It is for EMERGENCY USE ONLY! Do you realize it takes more courage and patience to walk away from a hostile situation than to lose your temper and fight? Think about it. I come to you with only Karate, empty hands. I have no weapons. then here are my weapons, my empty hands. Kung fu or gongfu (功夫, Pinyin: gōngfu) is a well-known Chinese term used in the West to designate Chinese martial arts. Its original meaning is somewhat different, referring to one's expertise in any skill, not necessarily martial. Many consider wushu a better term for Chinese martial arts, as it translates directly into martial art. Kung Fu (Gong-fu) literally means "hard work", "learned skill", or "skill acquired through application of time and effort", and is often used for the enormous variety of martial arts native to China. (Chinese boxing) is, with karate, the most popularly known of all the martial arts. It employs kicks, strikes, throws, body turns, dodges, holds, crouches and starts, leaps and falls, handsprings and somersaults. These movements include more techniques involving the open hand, such as claws and rips, than those used in karate. A very ancient form of martial arts which also has innumerable styles and substyles, Kung Fu includes the legendary Shaolin style of fighting, which was named after a 6th century monastery in Hunan, China. The Shaolin style was developed over many centuries, expanding from 72 basic fighting movements in its early development to 170 moves divided into five styles named after the animal the movements were supposed to resemble or represent; the Tiger, Leopard, Snake, Dragon and Crane. It is said that a monk named Bodhidharma (Ta Mo) traveled in 500 A.D. from India to China. He went to the Shaolin temple in Hunan Province. Bodhidharma found that the monks had no physical exercise and felt that meditation and physical movement were both important to attaining enlightenment. Bodhidhara designed a training program to help the monks strengthen their bodies, which then allowed them to endure long meditations. The series of movements developed by Bodhidharma eventually evolved into Kung Fu. Chinese Martial Arts include training in many traditional Chinese martial arts. These classes include both internal and external types of training. Internal training focus is on the proper body dynamics and the use of internal energy while external training includes muscle strength and flexibility, speed and coordination skills aimed at developing fighting skills and weapon training. Northern Shaolin Kung Fu - this is a Chinese martial art system that develops strong stances, with an emphasis on leg techniques like sweeping, kicking and jumping techniques. Tan Tui - "spring leg" is a Chinese martial art that uses routines to develop a strong foundation for all martial arts training. The routines include throws, joint locks, sweeps, jumping techniques along with punching and blocking. Long fist kung fu comes through master Han Ching Tan. It is a good beginning form that also has advanced connections. It consists of 10 short sequences repeated on both sides of the body for a great balanced workout. Shuai Jiao - "Chinese wrestling". This Chinese martial art's main focus is on throwing and flipping techniques. This art may very well be the oldest of all Chinese martial arts for empty hand combat. Paa Kua Chaun - "Eight Trigrams Palm" is one of three major internal styles of Chiense martial arts. This style with its changing middle approach to combat is unique and powerful. The eight palm changes along with proper entering technqiues provides the student with a wide variety of practical self defense applications. Hsing I - "Mind Body" is one of three major internal styles of Chinese martial arts. The emphasis is on the straight middle approach to self defense skills. H-sing I fighting skills is based on the 12 animal techniques. Tai Chi Chuan - "Grand Ultimate Fist". This style of martial arts is characterized by slow moving postures. This art is used for martial arts training and for health benefits. The Tai Chi forms are sometimes referred to as moving meditation. Chi Gung - is a method of training through breathing techniques that allows the body to open meridians to cultivate chi and develop internal energy. The health benefits of prevention and treatment of disease is commonly associated with the practice of Chi Kung. Chin na - is a Chinese martial art that used joint locks to control the opponent. Attacks to sensitive areas of the body with grabs and pressure strikes are used to immobilize an attacker. The art is about 400 years old and was founded by Muso Gonnosuke, a samurai who suffered defeat at the hands of Miyamoto Mushashi, the greatest sword man / warrior in Japanese history. Gonnosuke survived the defeat and was determined to find a way to beat Mushashi. After traveling around japan and studying other martial arts, Gonnosuke retreated to a shrine to meditate. He had a dream about the use of a stick as a weapon to defeat the sword. Gonnosuke developed techniques with the Jo suing his knowledge of the sword and other weapons. He incorporated techniques of the spear, the halberd, the staff and the sword to develop his new art Jojutsu. With his new weapon and techniques he went back to challenge Mushashi again and defeated Mushashi in what may have been Mushashi's only loss. Shindo Musu Ryu Jodo is the name of the art that Gonnosuke developed. 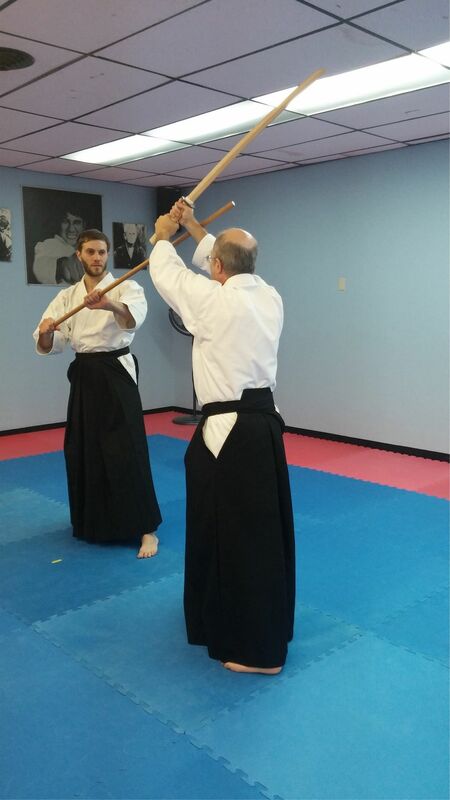 Jo-Do, the way of the stick, is the art of practice using a Jo, a 50 inch staff and a Bokken, a wooden sword. 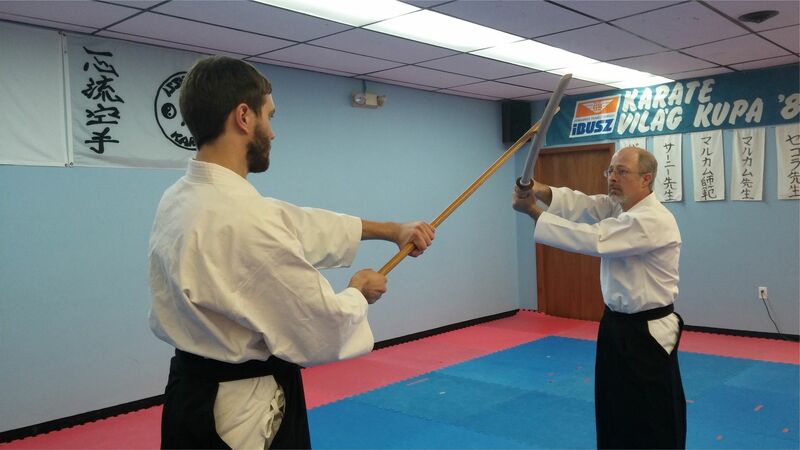 The Jo is used to defend against attacks by an opponent yielding a bokken in the way that a sword is used to cut and strike. 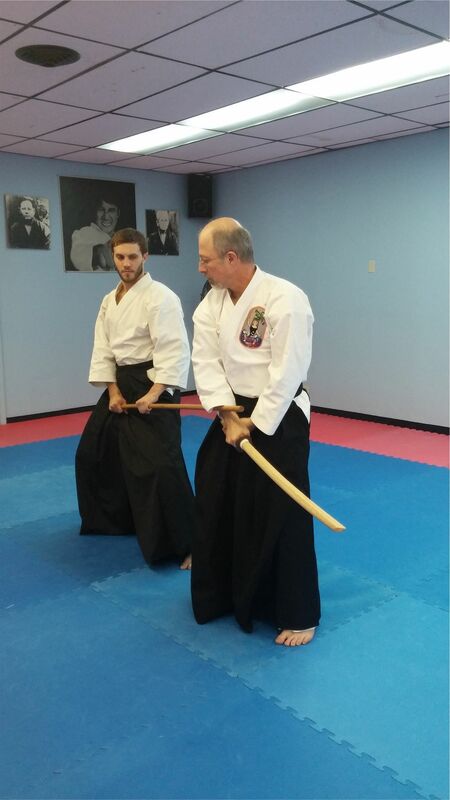 The Jo is used to block, counter and attack the bokken as well as targeted areas of the body. Training consists of individual practice (tandoku) and partner practice (sotai). Kihons (basics) and Kata (prearranged attacks and defenses) make up the the bulk of practice. Students are trained in martial arts tactics of distancing, tai sabaki, timing and many more martial art concepts in perfecting the Kohons and Kata. Tai Chi is a system of movements that develops physical, emotional and mental health. Those who practice this art feel a spiritual connection and a calmness about them. Although the origins of Tai Chi Chuan are not known for sure, one interpretation includes Bodhidharma. It is said he went to the Shaolin monastery and found the monks falling asleep during meditation. The series of exercises he taught them was known as Yee Chin Ching or Sinew Changing. The purpose of the exercises was to improve their physical condition so they hopefully would not fall asleep during meditation. The exercises were also used by the monks to defend themselves, since they were forbidden to use weapons. Another man important to the development of Tai Chi, Chan-San Feng, observed animals. He watched how they moved and protected themselves. He thought man could fashion a system of movements similar to those of the animals so that he could defend himself as the animals did. He observed that animals would use opposing techniques to win. If one animal showed strong force the other could defeat it by using the soft force. This is represented in the yin and yang symbol. Tai chi utilizes smooth flowing movements which put the enemy off balance by not countering with the same energy as that of an attack. The strong attack and the flowing counter lends itself to a very balanced situation. Besides self-defense applications, Tai Chi offers a feeling of peace and fulfillment.